For gods perceive future things, mortals present things and wise men things about to happen. In walking through a city, a moment’s punctuation can change one’s life forever. A moment can turn into a second of consciousness. 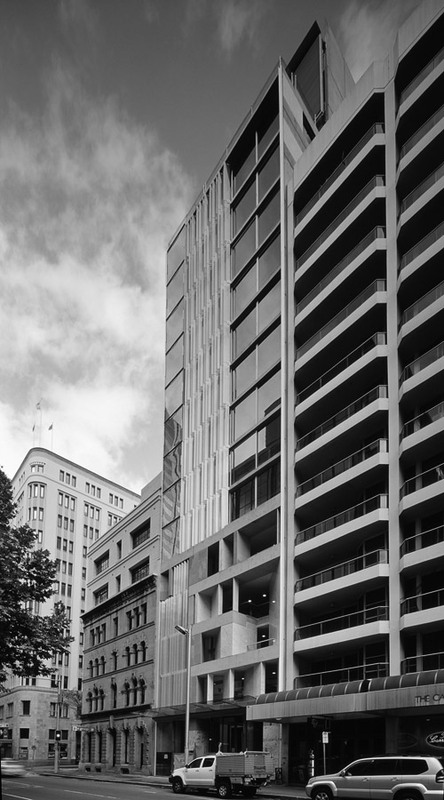 At 61 York Street, the past and future meld into one in a composition that is defined by a familiar and contemporary dimension of 2.4m; a dimension that translates to all measures of the building; all proportions; all elements. The composition is refined by the relation of ‘rondo’ in musical composition in both vertical and horizontal reading. Pedestrian movement toward the north articulates a ‘whiteness’ that searches for the defining moment of the white AWA tower; whilst pedestrian movement south outlines a sandstone image to frame York Street and Town Hall at the end of York Street; the cacophony of sounds omnipresent screaming the history of York Street in one image; 61 York St reflecting all past adjacent colours from Transport House’s rich green to the white sands and darker shades of the street; to offer something the sum of these, but something new nonetheless. 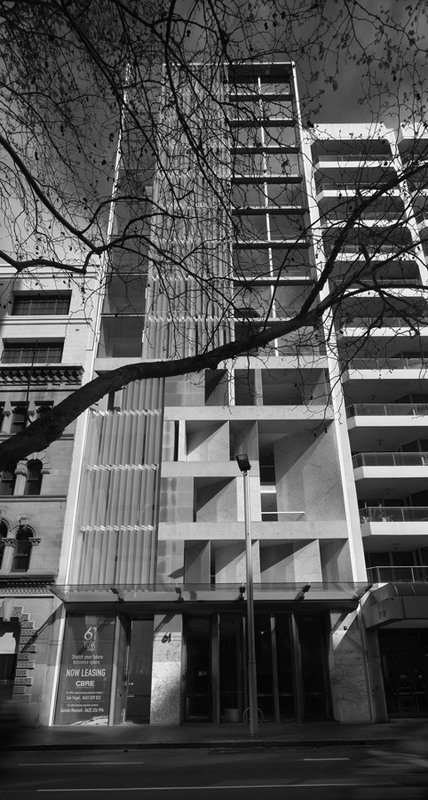 61 York Street sits neatly within the extant fabric of a fine street wall. 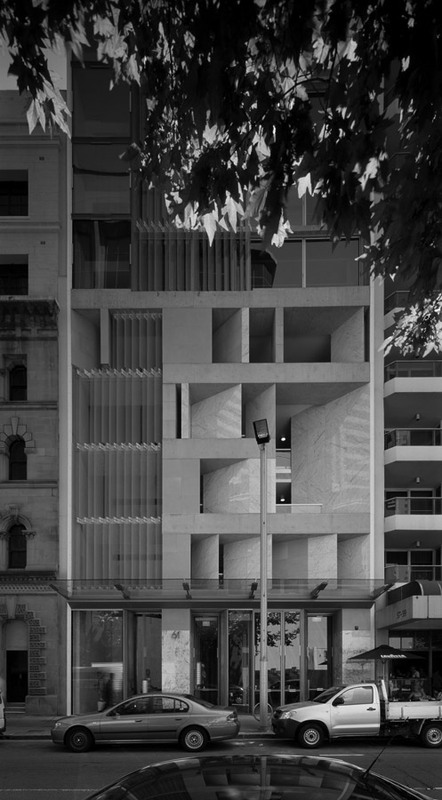 It offers space and a façade that subtly changes for the pedestrian in a walker’s part of our city. It offers a fine entry hall, open to the elements, five storeys in height, offering space plus light back to the city; light in its lantern-shades of music patterns that flicker through the white shades of glass. 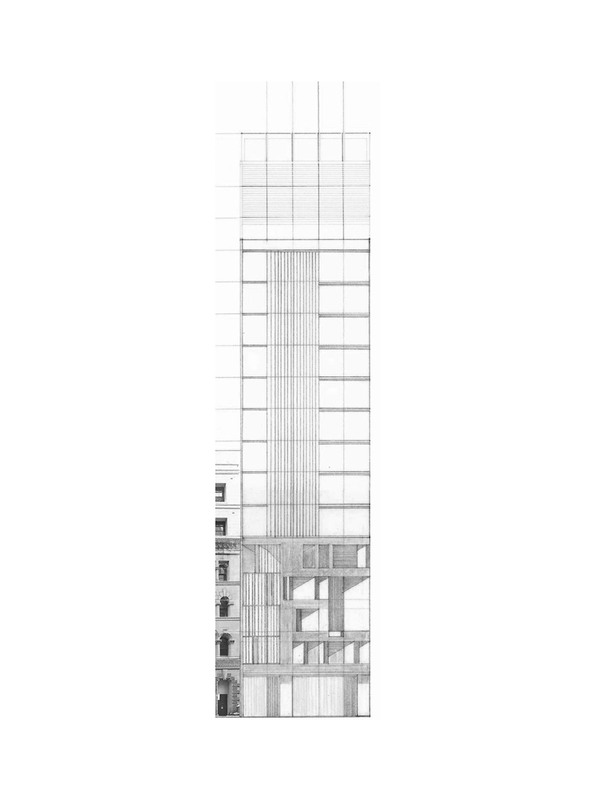 A simple plan develops beyond the façade to include enclosed balconies, separating the users from the street with a space of interstitial function; loosely labelled as a balcony; the bases of which lay in the tenets of our culture and our everyday desires; informality, composure and repose. 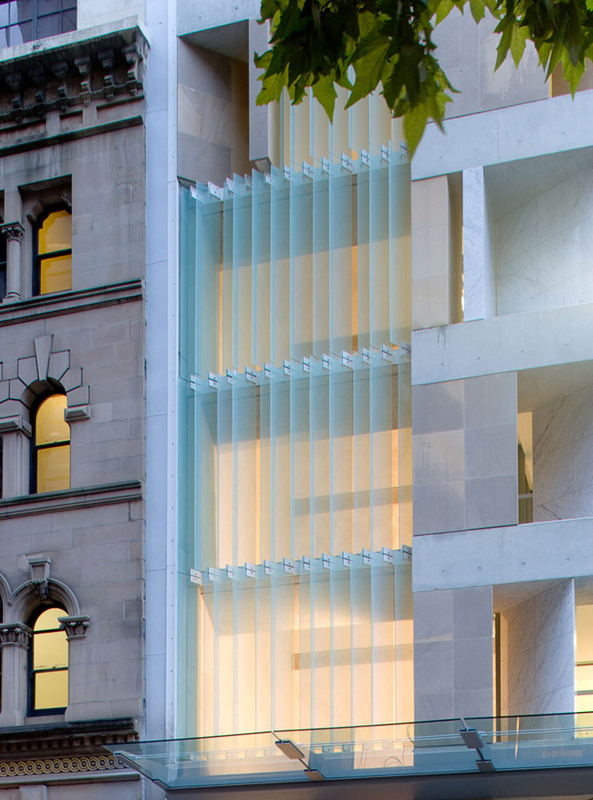 A structural, services and movement core on the south end of the building allows clear-span structure. 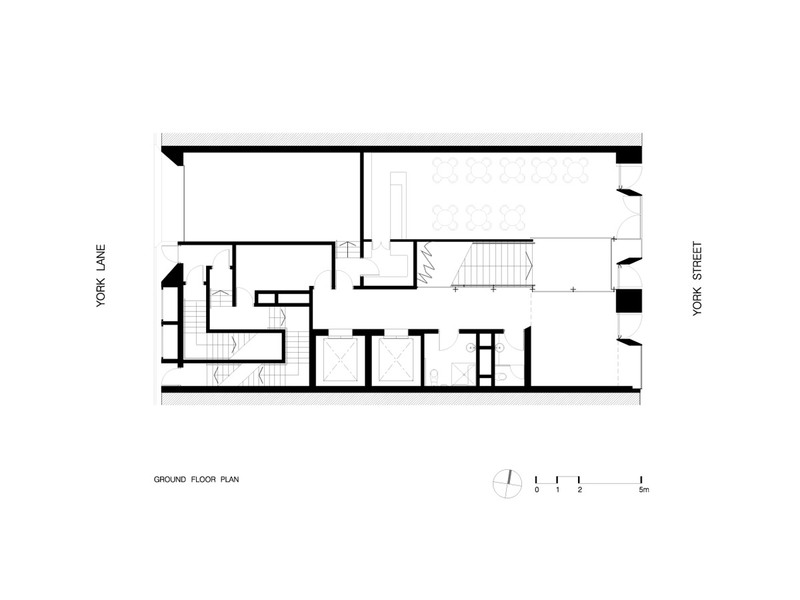 Windows at both ends of the plan provide ample light within the core space. The grain of light entry yields an image of Wynyard Park from inside. 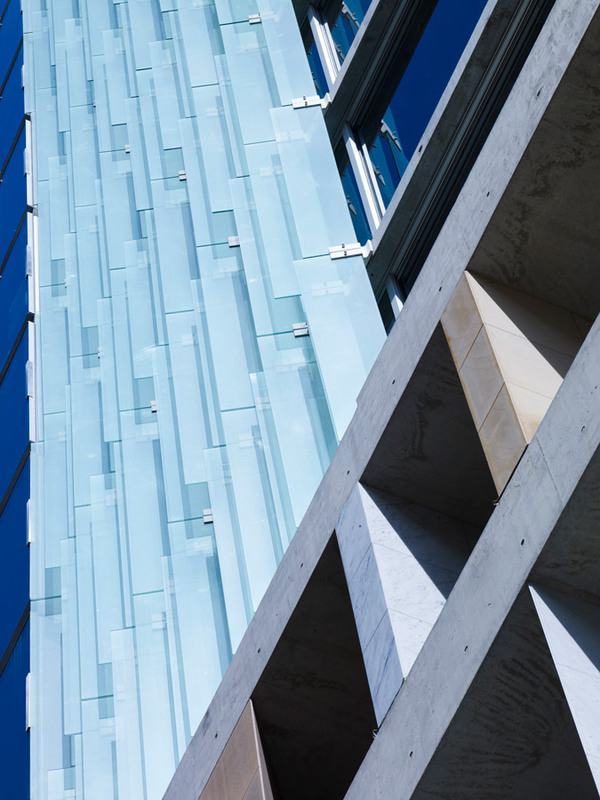 Like the structure of the human body, the building’s surface provides many clues as to its form and where the structure emerges; it is raw and transparent as a form that holds. 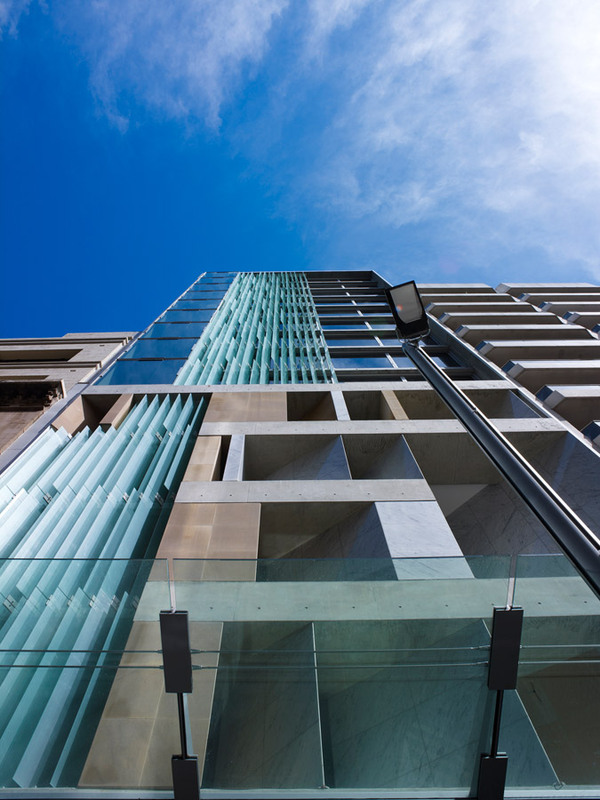 All services are placed tightly adjacent to the core and these services relate and provide to the structure, a 4.5 star energy rating which, in a profound movement of the City of Sydney Council, is now a requirement of all structures of this kind.